How Long Can a Deer Tick Live After Falling Off a Host? Those who live in rural areas or have a home surrounded by wilderness, must be educated about — and watch out for deer ticks. 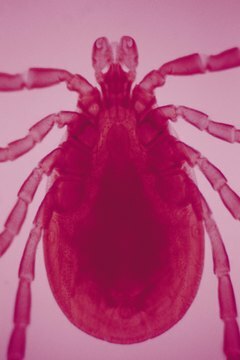 These nasty little parasites have a propensity for latching onto both pets and humans, and have been known to be carriers of Lyme disease. Protect your family and pets from falling victim to deer ticks by learning about the life cycle of these potentially deadly insects. Deer ticks (Ixodes scapularis) have a considerably longer lifespan than many other insects. Provided they are able to find adequate sustenance, deer ticks can live up to two years. They primarily feed on animal blood during the three important stages in their lives: transitioning from larvae to nymphs, then nymphs to adults and preparing to lay eggs as adults. Even without a host, deer ticks are able to survive for roughly three months. This is particularly evident during the winter. As the cold weather begins to take hold, deer ticks who have not found a host will take refuge in areas that are high in vegetation. They will remain inactive until late February or early March, at which point they will die if they fail to find a host. Fully grown deer ticks engage in their final feeding in early May. After latching onto a host, they will gorge themselves for five days to a full week. They will then mate either on or off the host. Shortly thereafter, the female will lay between 1,000 to 3,000 eggs and both adults will die within a few days. To ensure that you don't become a hungry deer tick's next host, there are a number of simple precautions to follow. Keep your lawn meticulously trimmed and move leaf piles as far away from your house as possible. Additionally, if your property features any nature trails, make sure they remain free of vegetation. Cameron Sherber has been writing professionally since 2010, and his comic strips appear regularly in "The High Plains Reader" and "The Huffington Post." He graduated from Carthage College with a B.A. in East Asian studies and Japanese language in 2006. How Do Lions Care for Their Young? What Is a Flatworm's Diet? What Animals Eat Deer Ticks? What Do Deer Love to Eat? How Do Leeches Attach to Their Host? What Is the Relationship Between an Oxpecker & a Bison? What are the Bags on the Inside of the Rear Legs of Deer? What Attracts Fleas & Ticks to Animals?